Need more information about booking Home 7293814 ? A newly build fully furnished and equipped two bedroom house with its own courtyard. 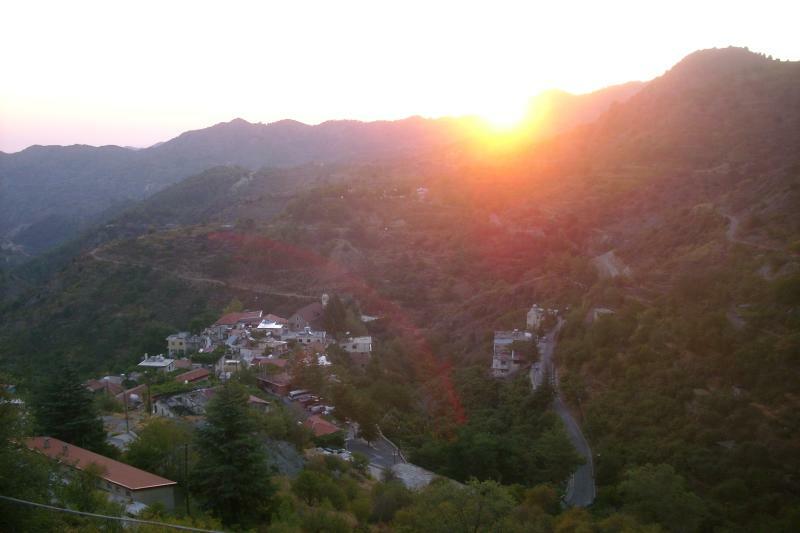 Situated in Polystypos, a traditional and picturesque Cypriot village on the Troodos mountains. The house is located in a protected pine forest just outside the village. It is surrounded by beautiful botanical gardens which contain wild local herbs such as lavender, sage, oregano, mint and trees such as oak, chestnut, walnut, almond, fig trees, vines and many more. The view from the balcony is just breathtaking. The house can accommodate up to eight people and has all necessary amenities. Linen (sheets and towels) is also provided. A washing machine is available for personal laundry. This house is ideal for people who love nature, quiet country-walks and who want to experience the authentic way of rural life and genuine hospitality. The green and clear environment, the relaxing atmosphere and the wonderful smells of nature make this place a small piece of heaven. Polystypos is one of the highest villages of Cyprus, standing at an altitude of 1150 meters above sea level. Distance from Larnaka Airport is 80 kms (approximately 1 hour 15 minutes drive). The village has a small supermarket and a restaurant opening certain days. A wood fire has been installed to make life more comfortable during the winter period. (wood supplied for the first night). Additional wood can be purchased from the village. Take the key from the lockbox by the door. Combination 1950. Always available on the phone. Smoking on the veranda. Pets only by arrangement. Inform me of arrival and departure time. Inform me if you are having a car in order to arrange for parking space. You can get in touch with Andreas (the owner) through the contact form on this page. Send Andreas (the owner) an email through the contact form on this page. Alternatively, if there’s a phone number on this page, you can call them. How do I contact Andreas (the owner)? If you’ve already booked, go to Manage your holiday booking to view Andreas the owner's contact details or send them a message. Or send Andreas (the owner) an enquiry through the Contact the owner/manager form if you’d like a quote or more info first. When you pay online through the Book your stay form, a booking request is sent to Andreas (the owner). You’ll find out within 24 hours whether they’ve accepted - no money will leave your account before then. You can also request a quote from Andreas (the owner) through the contact form. The owner will email you the total cost for your dates and a link to book and pay online. Use the Book your stay form to pay provisionally online. You can pay by credit/debit card or PayPal. Andreas (the owner) will have 24 hours to accept the booking and no money will leave your account before then. Why can't I call Andreas (the owner) before booking? You’ll need to contact Andreas (the owner) to do this. Send them a message in Manage your holiday booking or through the contact form on this page. You can request to change the dates or number of people on your booking via the Manage your holiday booking page. To change your holiday dates use the Edit booking button. If you need to change the number of guests staying then send Andreas (the owner) a message. If Andreas (the owner) agrees, they’ll send you a revised quote outlining the changes. You can review and accept/decline this from the Manage your holiday booking page. You’ll have 48 hours to take action before the revised quote expires.